Twentieth-century arrangements from choral and instrumental works. Composed by Johann Sebastian Bach (1685-1750). Edited by Michael Aston and David Owen Norris. Collection. 64 pages. Oxford University Press #9780193392618. Published by Oxford University Press (OU.9780193392618). ISBN 9780193392618. 12 x 9 inches. 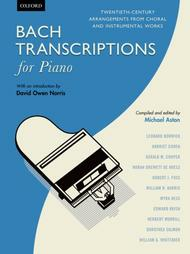 Demonstrating the range and popularity of Bach piano transcriptions during the early twentieth century, this collection contains exuberant fantasias and fugues, gentle transcriptions from instrumental works, and popular chorales. Includes introductory notes by the celebrated pianist and broadcaster David Owen Norris.